Dr. Khalid Salim is a Gastrointestinal, Bariatric (Obesity) and advanced Laparoscopic Surgeon with more than 25 years of experience. He obtained both his Bachelor Degree and Master Degree in Surgery from Damascus University, Syria and German Board Surgery FACS, Dusseldorf, Germany respectively. Dr. Khalid has practiced in Europe (Germany ) and Middle East (Damascus, Saudi Arabia, and United Arab Emirates) at various stages of his career. He has worked at King Fahad Hospital, Saudi Arabia for more than 13 years serving in numerous roles; Consultant general and laparoscopic surgery, Head of surgery department and Medical Director. He moved to United Arab Emirates on 2004 and as working as Senior Consultant -General, Laparoscopic and Bariatric surgery. • Member of MMESA (Mediterranean Middle East Endoscopic Surgeon Association). • Member of Emirates Society of Laparoscopic Surgeon. 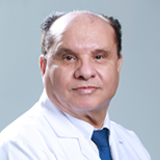 During his professional career, he has performed more than 36,000 surgical procedures which include general surgery, laparoscopic, bariatric surgery and abdominoplasty. Dr. Salim is fluent in Arabic, English & German.